It is my tradition to make a quilt for every person on my staff who retires. I will usually ask them what colors they like, then create a quilt of my own design. Laura, who is retiring this month after more than 30 years of service, went a step further and sent me a picture of an Amish quilt and said that was the style she wanted. 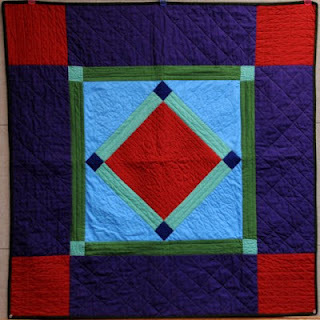 It was a very traditional "square in a square" pattern that is usually associated with Amish quilts. I did some research on different styles, but ended up returning to the simple design. I bought several fat quarters of Kona solids and started piecing. (How nice to have access to so many beautiful solids these days!) I had to get a full half-yard for the outside border and more for the back, but the fabric requirements were really minimal. As I was piecing, all I could think of was how I was going to quilt all this wide-open space! My standard stipple/meander was not appropriate for the Amish style. It needed feathers and grids. I have a longarm, but I'm not very experienced with can't yet do feathers and straight lines, and a gift is not the place to experiment! So I marked the quilt with a stencil for the center and surrounding triangles and a ruler for the grid lines everywhere else. Then I spent hours on my Janome quilting all those lines. After I bound it last night, I tried to get off the marker lines. They were supposed to come off with water, but they didn't very well. I ended up nearly soaking the quilt and had to put it in the dryer (did I tell you her party is today?) so it would be dry. I hadn't prewashed the fabric, so the beautiful, smooth quilt is now wrinkly -- and some of the marks are still there. Aaarrggghhh! But it's done and ready to give to Laura. I hope she likes it. Retired librarian, mother to a beautiful daughter, wife, and quilter in my spare time. Now that I'm retired, I have a lot more spare time to quilt!